The Rotary Club of Lahaina hosted a year-end social at Napili Point open to all West Side Rotarians including The Rotary Club of Lahaina, The Rotary Club of Lahaina Sunrise, and The Rotary Club of Lahaina Sunset. It was a great time for all and we watched the sunset while President Darryl Ng bartended and all participants brought great pupus for our potlock! We hope to do more socials together to create further fellowship among fellow Rotarians! The Rotary Club of Lahaina along with the awesome staff at the Whaler, a luxury condiminum on Kaanapali beach, installed televisions in 15 classrooms at Lahaina Intermediate School. Our Rotary club heard about the need for the installations when we were told that although TVs were delivered over a year ago, they were being strapped to carts because of the high cost to install (The DOE had received bids for upwards of $1000 per room!). 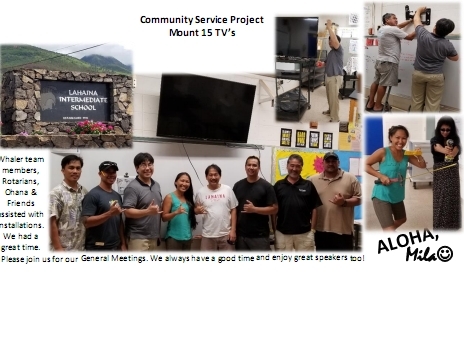 Rotary Club of Lahaina members including President Darryl Ng, President Elect Kalei Jaramillo, and Service Chair and PP Mila Salvador (Who is General Manager at the Whaler), along with whaler team members were able to install all TVs in 5 hours. We are very grateful to the Whaler for helping us with the needs of our local Intermediate school. The school will no longer have to worry about broken TV's on their carts! The Rotary Club of Lahaina prides itself on the partnerships we have made with clubs in the Philippines to bring school supplies to needy children, and to provide clean drinking water and sanitation to areas that have none. Believe it or not, many schools in the Philippines, even in the most developed of areas, lack access to clean water and sanitation for those that cannot afford it. Rotary Club of Lahaina teams up with OfficeMax Lahaina to donate hundreds of items and over $300 to our local elementary and intermediate schools! Rotary Club of Lahaina and The Whaler at Kaanapali Team up to clean up Kanaapali Beach! Come join us for our next beach cleanup on Saturday, November 3rd at 8am Makai (oceanside) of the beach Hale! Parking is free (just tell them you're with the beach cleanup) and The Whaler provides coffee, iced tea, water, snacks, and all the equipment needed to help keep Kaanapali Beach clean! 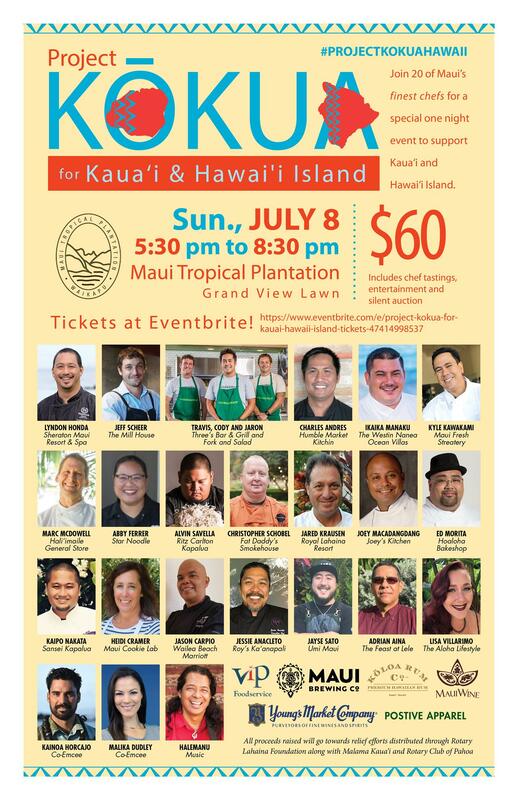 Rotary Club of Lahaina and our foundation the Lahaina Rotary Youth Foundation, worked with project Kokua to help raise almost $40,000 for relief efforts on both the islands of Hawaii and Kauai.